Marketing Director talks about new wedding song. Is your time limited? Need the facts, just the facts and nothing but the facts about wedding bands? If so, then Novell has built several easy to read Squidoo lenses for a variety of wedding band topics. For those who don’t know, a Squidoo lens is an easy-to-build, single web page that can feature a company’s products, point to blogs, feature favorite links, RSS feeds, Flickr photos, Twitter feeds, Amazon books or music, and so much more. That way, when someone is looking for recommended information fast, a lens can get them started and sent off in the right direction. Novell’s collection of Squidoo lenses include basic facts about precious metals, new products, popular styles, and other helpful links to aide a consumer’s purchasing decision. Novell Wedding Bands Can Be Custom Made – Just For You! Going green: How Novell is helping to reduce our environmental impact within the jewelry industry. The November 2008 edition of JCK Magazine features a quote from Novell marketing guy Rick Mulholland about the methods Novell employs to reduce environmental waste within the jewelry industry. Free wedding band catalog PDF downloads. Novell Design Studio is happy to announce the availability of all of our catalogs and brochures as a free download. Both consumers and retailers alike will hopefully find these downloads to be a convenient way to learn more about Novell, and notice that they save time as well as lessen waste for the environment. After all, who is not thinking “green” nowadays? The catalogs and brochures are available at http://www.novelldesignstudio.com/catalog.php. RSS Allows Easy Access to Wedding Band News. In response to the vast amount of advertising clutter that is in the world and on the Internet today, Novell Design Studio allows retailers and consumers to keep up with their latest editorial and special advertising placements via the Novell News webpage. Hosted on the company’s website, interested parties can subscribe to the section’s RSS feed and have news delivered directly to their e-mail account, cell phone or personal webpage with just the click of a button. Over the past year, Novell (a leading wedding ring manufacturer which specializes in product customization) has been spreading the word about their bridal jewelry through a variety of online methods. Videos, brochure downloads, and RSS all combine to increase the reach of Novell’s unique message – your wedding ring can be made your way – and helps supplement their traditional advertising. With individual time constraints and concerns today about the impact of excess packaging on the environment, online news distribution greatly reduces the need for printed material. Customers also may quickly access additional information without further delay. Why Use RSS to Keep Up with Novell Wedding Ring News? RSS (Rich Site Summary or Really Simple Syndication) is a format for delivering regularly changing web content. Many news-related sites, weblogs and other online publishers syndicate their content as “feed” to whoever wants it. RSS is convenient for people who regularly use the web. It allows you to easily stay informed by retrieving the latest content from websites that are often visited or found helpful. Messages are delivered to a central location, and time is saved by not needing to visit additional websites individually. The number of sites offering RSS feeds is growing rapidly and includes big names like Yahoo News, Google News and many more. Visit www.novelldesignstudio.com/news.php for more information and to subscribe. Marketing wedding bands without the waste. 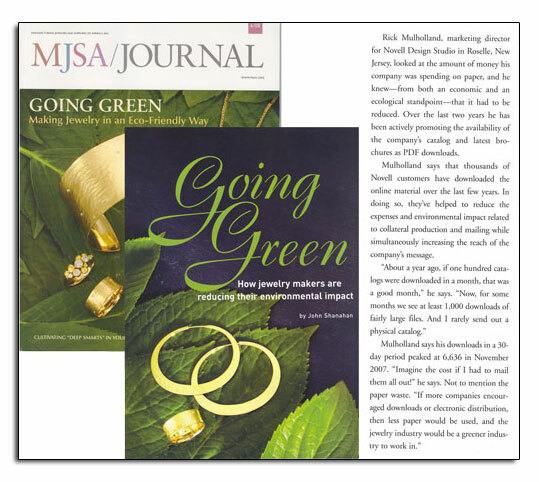 The June 2008 issue of MJSA Journal featured Novell’s marketing guy Rick Mulholland explaining the company’s success with offering catalogs and brochures as downloads to consumers. Download the MJSA Journal feature. Download a Novell catalog or brochure. Read more about what Novell offers as a free download or video brochure. Novell's Rick Mulhholand talks to MJSA about Novell's green marketing efforts.